We are well into the Christmas season but it is far from over as we celebrate the 12 Days of Christmas. My parents were married on January 6th, 1946 so finishing up the Christmas season on the twelfth day was part of my Christmas growing up. When Fran was just a baby we were concerned with Christmas becoming overwhelming and after an inspirational sermon by our pastor, Fred Warnecke about celebrating the 12 days of Christmas we decided to make that a family tradition and have been opening gifts, visiting friends, having a special meal/food or attending a museum/movie/event on every one of the days of Christmas. It gives us the opportunity to take advantage of after Christmas bargains and eliminates some of the stress of having everything done before the 25th. Also taking some time to enjoy each other's company rather than just gift giving has become an important part of our celebrating the season. Now Fran is grown, married and has her first child, Zach, and like many new parents she wanted to start her own Christmas tradition. So on Christmas morning we went to her place, had the traditional breakfast that her husband, Josh has always had, and opened gifts there. They are continuing the 12 day tradition but there was still plenty for Zach to open from his grandparents and godparents. My son Hugh, Zach's godfather, experienced this first adult Chrsitmas responsibility - putting toys together on Christmas morning. Zach is only six months old but he already loves everything about Christmas. He loved being involved in the preparations from wrapping presents to cookie baking to having an advance peek at his gifts before they were wrapped. He loves the Christmas tree and he is enjoying all of his new gifts. Here are some pictures on Christmas morning. Zach sat on his father’s lap opening gifts on Christmas morning. This was one of his favorites – The Fisher Price Laugh & Learn Learning Toolbench from his godmother. Here is another favorite – also from Aunt Sonny –one part of the Vtech - 3-in-1 Smart Wheels . He is ready for this part but has to wait a while for the ride on. Yes, the gift was from Aunt Sonny but Grandma gets to hold him playing with it. Here is Zach smiling with his mother – A big Christmas smile. Our friends, Parikshit, Umang, Shalini and Saumya joined us on Christmas Eve for a traditional meal and Umang brought a present for Zach and I – a gorgeous set of books that we will enjoy together. They include The Mitten by Jan Brett, In Grandma's Arms by Karen Katz (She’s a favorite of both Zach and me) Love You Forever and Hide and Seek Colors. Thank you, Umang! Reading together is something Zach and I love to do together. Although he seems to like eating the books as much as reading them sometimes. Saumya is almost 2 and calls Zach “baby.” I wonder what they’ll call each other next year. They are both lively and I can picture some raucous celebrations in the future. We had a wonderful Christmas with family and friends and the season continues as we plan for our neighbor’s wedding on New Year’s Eve, finishing up the cookies before we gain too much more weight and a visit to the Montclair Museum for the Cezanne exhibit that ends this week. Since Christmas day Zach has been enjoying some of his new toys which are finding a home at our place. I think Zach is developing an appreciation for music. All the toys these days seem to play music. And so yesterday I brought Zach to the piano and played Mary had a little lamb. Hhhmmm...he really liked the piano... I should call Patrick and have it tuned....then it will sound even better. There is something more than special - its spiritually uplifting about celebrating a baby's first Christmas. Everyone around Zach seems to be in their own pensive state experiencing this moment in a new way. 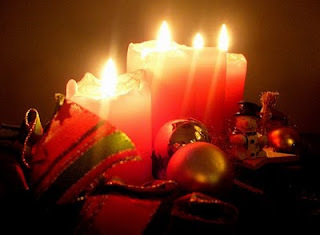 As we approach the New Year we are full of the wonder of Christmas and excitement for all that will be new ahead of us. I have enjoyed writing this blog so much this year and I look forward to sharing more about grandparenting in 2010. Enjoy the rest of your Christmas season everyone and Please share your comments about your Christmas celebration in the Comments. What’s in a name, anyway? My daughter wanted my husband and I to be called Nana and Pop-Pop which is what my husband’s parents were called because her husband’s parents were already Grandma and Grandpa and she wanted us to be called by something different. I protested because I did not want to be called Nana which sounded old and old fashioned to me. I am a traditionalist at heart but I don’t like to be old fashioned or thought of as being old. I insist that I am still middle aged which I admit is getting to be a tougher sell every day. My husband wanted to be called Pop but Fran said it did not match with the Grandma I am insisting on. My grandson, Zach (six months old) and my husband have become great friends - they really enjoy each other’s company. It is a joy to watch them interact. I can see them becoming quite a tag team. Pop really seems like the right fit and just recently my daughter said that Pop was fine. Wow! I am really happy about that because I know it makes my husband happy, it is easier to say, and indeed it just seems like what he should be called. One of the things that is a topic of discussion when you are still a “grandparent-in-waiting” is what you will be called. It may be a surprise to some people that this is actually a parental decision – or so they think. In reality whatever a child begins to call you may stick and that is why so many grandparents have some unusual monikers. But we can certainly influence our name by using our preference at an early age. On Grandparents.com I moderate a group for New Grandparents and the group attracts new and expectant grandparents. When introducing themselves they often talk about what they will be called and I have been surprised at the wide variety of possibilities. Some are from their family cultural origins or what their parents were called. Some want something young, playful and fun sounding and others want to be thought of as warm and comforting. You need a name that goes with your “ambiance” after all. It is actually more difficult to choose a name as a grandparent than as a parent. Mommy and Mom seem to cover all the bases but not the case with being a grandmother. Our role is non-essential and so we are allowed much more latitude with our name. A timeless toy for children is a building toy. All children enjoy blocks, Legos Tinker Toy, Lincoln Logs or any building set. At A Time to Play Holiday Showcase I got to see up close a modern green version of building blocks - EnviroBLOX by Cadaco toys. This award winning new idea featured on the Today Show and Regis and Kelly is really quite creative. 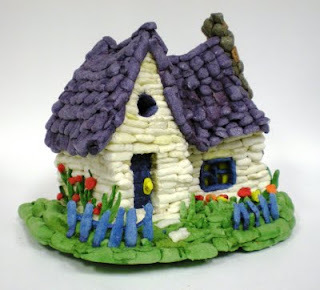 The building "blocks" which are made of cornstarch are flexible, biodegradeable and nontoxic. When they are moistened with a sponge they stick together. The fun part for me is that they change shape so that you can build them into whatever shape you want. They come in sets of various sizes and each set has suggested designs to build. EnviroBLOX are recommended for Ages 4 and up. I have been staying away from reviewing videogames and electronic gadgets and sticking to discussing toys that grandparents will like and may even play with with their grandchildren. EnviroBLOX fits that bill. I highly recommend them. You can order order EnviroBlox and other items that I have reviewed at Amazon.com. Click on gifts under labels in the sidebar and see all of my recent product reviews with links directly to Amazon. I love blogging – so much in fact that I have two very different blogs – Marion Conway Nonprofit Consultant where I blog about topics of interest to the nonprofit community and The Grandma Chronicles where I blog about grandparenting. I never thought that I would have the same post on both blogs but here it is. I started to put my thoughts together on this topic for my consulting blog and then, it came to me...This topic works for both blogs! I started to do some research for this post on the web and was happy to see that there are wonderful resources and ideas available. There was even a blog post from Beth Kanter a year ago that I contributed to on this subject. We should be thinking about philanthropy as a core value to teach children. It is an important part of wholeness in adult life and it should be something that just comes naturally. That is my basic philosophy. So just as we teach the importance of education to our children by helping with homework, providing enjoyable educational experiences, encouraging and rewarding working hard in school there is the parallel in philanthropy. Children learn about philanthropy by example, by doing things themselves and by being taught about it. We start with the very young by teaching and practicing caring and sharing. Older children participate in community service and contribute their time, talent and treasure as we say in church. There are so many things that we can do with children to develop a spirit of community service. Whether it be volunteering at a local food bank or raking leaves for an elderly neighbor there are opportunities everywhere in our everyday lives. If you want your children to be enthusiastic about participating in philanthropy then it has to be something that is of interest to them. It may be in helping poor children or the environment. It may be supporting children who are very sick. You may have your own interests – I know I have mine – but it is a good idea to explore with children how they would like to help others and then for them to have as much of a hands-on experience as possible. At our church all ages participate in our holiday giving program. Young children decorate Christmas cards and small trees for the elderly. Older children help stuff Christmas stockings with a variety of supplies for men at a homeless shelter. The teens participate in cooking a special meal for the homeless shelter that is served with tablecloths, flowers and a festive theme. The hands-on experience with philanthropy is an important part of their development. The hands-on experience I remember most with my son is that for his Eagle Scout project he collected sleeping bags for children in Newark to use for summer camp. He also collected money and arranged a big discount with Coleman to buy sleeping bags. The day he and fellow scouts went to Newark to unload the sleeping bags from the delivery truck some teens were getting sleeping bags for a trip that weekend. I think my son has always appreciated his own sleeping bag a lot more since then. Sometimes our children have set the example for us. When my son was a freshman in high school he came home and TOLD us he was going on a trip to help re-build a burned Black church in the South during his Spring vacation. My husband decided to take a week of his vacation and go with him and several years later my husband and I went together. My daughter has a caring spirit and when she works with young children she is particularly thoughtful of a child that needs a little extra personal attention that can make a difference. She is much more the touchy feely type than I am and I know she touches the lives of children she works with in an important way. Teaching the concepts – Many people in my generation were brought up not knowing anything about family finances or giving. Looking back my parents were generous with their time, talent and treasure. I was oblivious to the treasure part but I could see the time and talent part. We have taken a different tack with our children. They know about our giving patterns and that it is spread across local, national and international causes. They know the local organizations where we are involved very well. They know that we have priorities for our giving and that charities are named in our will. When our children were young we made matching gifts to charities that they gave to and this encouraged them to give even more. They know our “philanthropy philosophy” and as adults are forming their own. When my son started working he immediately made a commitment to make a contribution to KIVA with every paycheck. He has his own philanthropy philosophy and it developed as he was growing up. Our philanthropy manifests itself differently at different stages in our lives but it is important at every stage. For children and young adults it can be bursting with energy and innocence and a spirit true to the origins of the word. There is no time like the holiday season to start. Kayta Andresen from Network for Good offered a fantastic idea last holiday season in Beth Kanter’s post: "Give with your kids day. "She suggests giving a child $25 to donate to a charity. You can help them research the type of charities they are interested in online. A favorite book of mine on this topic is Raising Charitable Children by Carol Wiseman. A special note to grandparents: One of the things that grandparents do is fill in some blanks as parents have busy schedules. This is an excellent responsibility for grandparents to take a leadership role in and find things you can do together with your grandchildren than enrich your lives and that of others. It’s the day after Thanksgiving and we had a wonderful family gathering with 12 adults and 2 under 2. I love the holidays and I seem to get some super spurt of energy to make everything special. It helps that my husband is the best sous chef on earth and doesn’t mind peeling, cubing and dicing vegetables for hours. My cousins are the best super cleaner uppers I’ve ever seen and they pair up as a washer drier team and my kitchen table which once was filled with cooking prep was then filled with clean pots, pans and platters. My son and niece did the breakdown of tables and moving furniture back in place. Zach, my grandson, enjoys being with people and feasted on Mom’s homemade pears – I’m going to post that recipe soon. The meal was delicious and sharing lots of leftovers means that we’ll be done with ours today. It was a perfect Thanksgiving. But now it is time to get ready for Christmas. Sunday is the first day of Advent and the fall decorations are being packed away and the first candle on the Advent wreath will be lit at Sunday dinner. Grandparents have a special responsibility to bring tradition – both new and old to the holidays. And reading holiday books is the perfect tradition for grandparents to bring to the table. Here are some holiday books that you may want to give as gifts or keep at your home to share with your family. This is a wonderful classic to read on Christmas Eve and children of all ages will appreciate it when read with enthusiasm. There are many versions of this story available but I am a fan of Mary Engelbreit illustrations so I am recommending this one. This beautifully illustrated book was a favorite of my children’s and I have kept it to share with my grandchildren. There is a newer versionavailable now but it also is the perfect Christmas read at bedtime during the Christmas season. This book describes with vivid photographs the work of growing olives, harvesting and pressing them to make oil. It goes on to show how a family uses the oil to celebrate the ancient festival of Chanukah in Israel. This is a perfect book to read with young children and connect history with our current life. This story of a 7-year old American Muslim, observing Ramadan with her friends and family is beautifully written and richly illustrated. This is a book that will be enjoyed and is educational for children and adults – both Muslim and non-Muslim. Karen Katz is one of my favorite authors of books for young children and this book is highly recommended by pre-school educators as THE book to use to teach young children about Kwanzaa. The eye catching illustrations make the celebration come to life. Some children celebrate multiple holidays at home and many children learn about multiple holidays in preschool. This book talks about what kinds of things families do together for the Hanukkah and Christmas holidays and embraces both charmingly. These books are reasonably priced - some are incredible bargains at Amazon right now - and with each one a grandparent can start the tradition of reading about the holidays. The readers of this blog would love to hear what are your favorite holiday books too. Please leave your comments and share your favorites with us. Zach is five months old now and his parents are more than ready for date night. So my daughter has lined up both sets of grandparents to babysit on alternate weekends. We have watched him twice now and the best way for me to describe this is “Grandparent Heaven.” We see quite a bit of Zach during the week and sometimes for dinner but having him all to ourselves in the evening is a whole other experience. Here’s what our recent visit was like. Fran was at our house in the afternoon and we walked in the park and then she napped when Zach napped. As usual when he woke it was an active time of day and all the adults took turns entertaining and being entertained. Then Fran left and we had five hours – Yes, five hours to ourselves with Zach! Zach was still in active mode and he spent some time on the floor and in his bouncy seat before dinner. At dinner we tried to feed him his newest dish - applesauce - but this was a messy event and we heard him loud and clear: “You can keep that applesauce for yourselves – I don’t like it!” But he enjoyed a sippy cup of water to no end. Well by this point we were ready to wind down and upstairs we went for a bath. Our niece gave us a baby bathtub she is long done with and so we have our own. Zach loves the bath. I filled the tub and Hugh undressed Zach. He loves being naked – what baby doesn’t. He was in the tub for just a minute when what should there be but a giant pee! I held him up and Hugh provided fresh bath water. Zach loves the water and splashes and could probably stay there for hours if we let him. His parents have some bath toys but did not bring them but I had a rubber duckie in my hidden closet of treasures and we all had fun with that. Hugh and I broke into a rendition of Rubber Duckie from Sesame Street and Zach smiled and laughed. Then Grandpa handed him directly into the hooded towel I had waiting. Soft and clean and as nature intended. Zach’s grandparents sang some fun children songs and we all had a good time. Time for the sleeper – how cute – once he begins to put his fist in his mouth which is Zach’s way of saying he’s hungry. I went to the kitchen to make the bottle and when I returned Zach was enjoying playing on the bed. By the way, this quilt was made for Fran almost 30 years ago by Kathy Cassidy. When he was ready for the bottle, Grandpa got the honors. We still have the rocking chair we had when Fran was a baby and it is near the windows in our bedroom. Zach loves light and was staring at the unlit light above him. I turned the dimmer on low and Zach had his bottle and stretched out in the most adorable restful pose. Hugh held him for a long time and then put him down in the Pack n’ Play. We sat up on our bed and just wallowed in what a nice night we were having. In a little while Zach was restless. Hugh picked him up and after a big burp followed by little ones he seemed wide awake again just as his mother said would happen. It was my turn to hold him and I sang Hush-a-Bye just as I did for his mother. His eyes got heavy and then closed and I laid him down on our bed this time. We laid on either side just soaking in the peace of being with our sleeping grandson. Then we heard his mother’s footsteps on the stairs and it was time for Zach to go home. Grandparent heaven – this is it. In October I began to write reviews of products I had seen at the A Time to Play Holiday Showcase. A couple of weeks ago I was in New York again – this time on a mentoring trip with young women from Saint Vincent Academy in Newark, NJ where I went to high school. It was a wonderful day and we visited the Good Housekeeping Institute where they test products from appliances to toys along with Seventeen magazine and Wave Hill park. It was a wonderful day but that’s a whole different story. I noticed that they had some of the toys I had seen at A Time to Play that were being tested for their Best Toy List in the December issue and here are a couple that I personally checked out at A Time to Play that made the Good Housekeeping 2009 best toy list. GH first tested the toys to meet their own safety standards and any claims made by the manufacturer and then had 50 kids come in to choose their favorites. So these toys meet the requirements for safety and kids loved them. You can’t ask for anymore than that. In October my first product review was for games made by a small company I Can Do That and I featured a picture of their Busytown game. 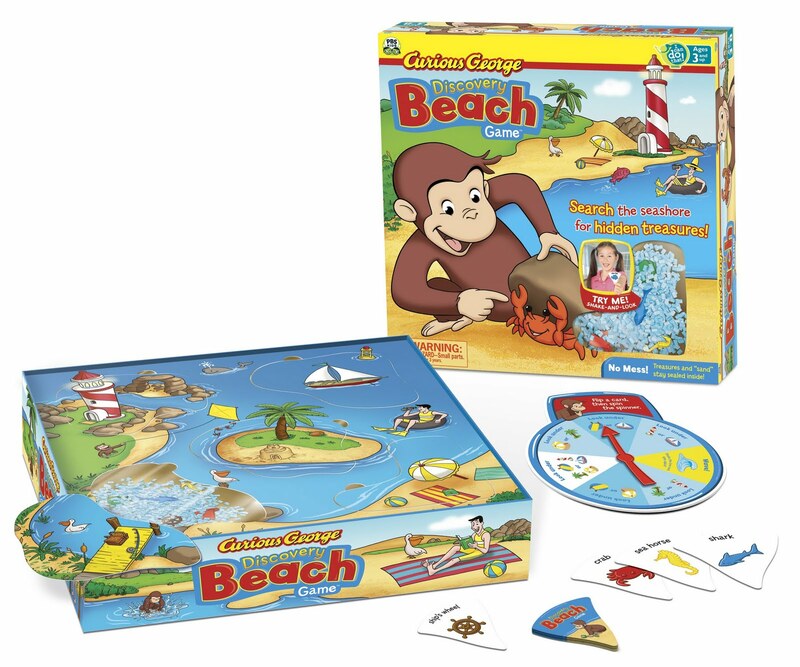 The Good Housekeeping 2009 best toy list includes the Curious George Discovery Beach Game. This game is part memory challenge and part scavenger hunt. It is designed to promote matching and memory skills, and inspire exploration and discovery. 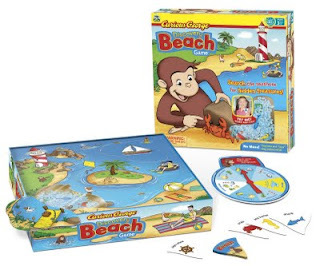 I recommend this whole line of games but here’s the picture of the Curious George Discovery Beach Game. A toy for older children that also caught my eye and is on the Good Housekeeping list is the HyperBlast game from Wild Planet. This is a numbers game that gives players a physical and mental workout – a good alternative to computer games. This reasonably priced, $20 game is for ages 6 and up and there is also a version called 1-2-3 stomp for pre-schoolers. Both of these games look like a lot of fun but my guess is that some grandparents will have trouble keeping up with their grandchildren if they try to play this one together. I mean physically of course not mentally – of course. I hope you enjoy your holiday shopping and get to play with whatever you get for your grandchildren. Having someone to play with is part of the fun of being a grandparent – Isn’t it? Don’t forget to add your comments if you get any of these items - I’d love to have your review added to this post. This article highlights another product I learned about at A Time to Play Holiday Showcase in New York on October 1st. I had the pleasure of speaking with Lane Michel of Onionhead. This is a small company that specializes in “Teaching us what to do with what we feel.” The company has been around for fifteen years but their products have been marketed to psychologists and special education teachers and now they are beginning to market to the general public. Onionhead is a line of products designed for children of all ages to help them identify and communicate about their feelings. 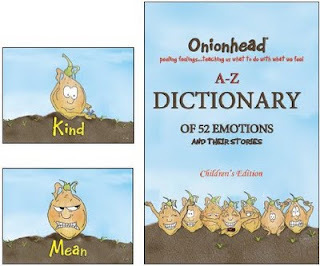 The products include storybooks featuring a specific feeling, a set of magnets depicting the Onionhead character expressing a wide range of feelings and two Onionhead Feelings Dictionaries – for younger and older children. There also are greeting cards, a coloring book, and tee shirts. Onionhead received the 2009 Toy of the Year award from Creative Child magazine. When you buy a product from Onionhead you can feel good all over. Their products are all made in the USA and they are proud of being ahead of all government regulations for safety and environmental standards. In addition they have an associated non-profit, Save the Rain, which teaches water deprived communities to catch and use the rain as a sustainable water supply. For every purchase of an Onionhead product, a certain percentage is donated to Save the Rain. These products are not “toys” but if you know a child with issues about expressing their feelings, this is definitely a product line worth checking out. You won't find these products in stores but you can order them online at their website. Halloween is always fun in our neighborhood. We have sidewalks and the houses are not too far apart. Everyone decorates for the season and mums, pumpkins, and haystacks abound. We have our share of those who go the extra mile with webs, scarecrows, etc. It is the type of neighborhood that parents drive their kids to for Trick or Treating. Frequently the kids are in groups and the parent groups stay at the sidewalk as children come to the door. It is a social event for the parents and children. The toddlers whose mother grew up across the street were trick or treating with parents, grandparents and aunt. What a proud entourage! I always offer candy or an alternative and the non-candy choices of play doh, stickers and pencils were very popular this year. I can personally attest that High School Musical stickers are popular even with older girls. Halloween is always a time when we remember one of the reasons we have stayed put in our strong family oriented neighborhood for 25 years. Although we keep hearing that Trick or Treating is on the decline because of so many worries parents have to deal with these days, it is alive and well in an old fashioned, fun way on our block. This year was extra enjoyable because of Zach. 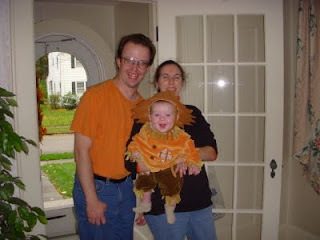 His parents, dressed in orange shirts with Zach in this scarecrow costume had fun visiting the neighbors but declined the candy treats. Zach was intrigued by the children that seemed to come to our door nonstop and since it was a mild night he was able to be at the open door for quite a while. Princesses, ladybugs, sports heroes and just some face makeup all seemed to catch his eye. One interesting thing that happened this Halloween was that a boy about 10 years old proudly offered me a piece of chocolate on a card with a great picture of smiling children and a big Thank You note. It was compliments of www.ReverseTrickOrTreating.org which promotes Fair Trade products. What a great promotional idea! I considered naming this post “Zach grows up” but that seemed a bit pretentious. On Columbus Day, October 12th, Zach had solid (I think that’s exaggerating actually) food for the first time. We were delighted that Fran chose to share this event with us and it certainly was a fun event. The banquet consisted of the traditional first meal of rice cereal. Zach was in his “Lion seat" – sort of a portable high chair which he has already been enjoying at the dinner table and all eyes and smiles were on him as his mother aimed the first spoonful at him. A few seconds later the cameras were out and our family chroniclers snapped away. So did Zach enjoy the meal? This picture speaks for itself. He had a great time! Since then both Hugh and I have had a chance to feed him and it is really so much fun! Zach sticks his tongue out wide, slurps up the cereal and enjoys his supper. However, lately he has been looking at us while we eat as if to say “Is that all there is?” The plan is for him to have applesauce next – for the first time on Thanksgiving – just short of being six months old. Check out The Grandma Chronicles over the weekend – I’ll be reporting on the first Halloween – and yes, of course I’ll have a picture. 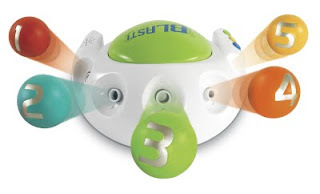 Today’s product review swings to the other end of the spectrum from yesterday’s review and features toys made by Baby Genius and available only at Walmart. Baby Genius is 10 years old so although it is an established company it is a new name to many of us grandparents. At the A Time to Play Holiday Showcase I had the opportunity to look over some of the new toys in the Baby Genius product line. 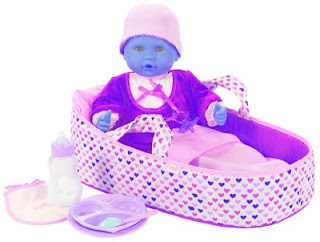 They are introducing 24 new toys for infants - pre-school ages. The toys are music and activity based. I was told that they cost about 20% less than the competitive product but I have not personally checked it out in stores. 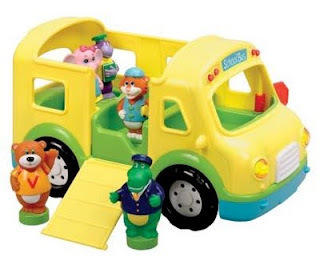 The Singing Bus: This bus with little people plays “The Wheels on the Bus.” All of us grandparents remember that one – Guess what? It’s still popular. Pet Care Center – Our kids had doctor and nurse kits but I saw two products featuring veterinary care. This is definitely a modern twist and there is much more veterinary care than there used to be. This toy has a small dog, stethoscope, and other care items and the carry all for it is a “pet carrier.” This may be a good toy for young children who have pets to learn about and not be afraid of their pet going to the vet. This is a reasonably priced line of toys with items beginning at $5. Visit the Baby Genius website for more information on the complete line, the Parent’s Lounge AND you can download for free 18 songs in the “Circle of Education” designed to help pre-schoolers get ready for school. The songs feature themes like washing hands and taking turns. Check back tomorrow for another product review. To see all of the product reviews click on "Gifts" in the Label section of the sidebar. Holiday Gift Ideas - Today's Feature: Games from I Can Do That! Products from a small company - “I can do that!” were among my favorite products that I learned about at the A Time to Play 2009 World Showcase on October 1st. For grandparents, this is a company that you probably have not heard of. It was only founded in 2007 but it has already won over 40 awards – some from very prestigious educational toy sources. These games are for children 3 and up. Characters I Know - Although they are a new company their products feature classical characters that we all know – Dr. Seuss, Richard Scarry and Curious George. Educational and Fun - The games feature large floor mats and young children develop skills and build confidence while having fun. Each game also has educational features – but the learning takes place as part of the fun. It is light years away from flash cards. The games are designed to develop teamwork, promote attention to detail and develop object identification and matching skills. Electronic free - There are no batteries or electronics!. Wow – I love that! Easy to find – ToysrUs and other mass retailers carry these products – no excuse that I can’t find it. Website – The company has an excellent website which includes a good page for parents to learn about playing games with young children. Check ou the I Can Do That and A Time to Play websites. I'll be writing about products all this week so check back for more gift suggestion articles. And please...post your comments if you are familiar with any of these items or what you want to know about in the reviews. I have only one word that best describes Zach's Baptism - Perfect! Last Sunday was Zach’s Baptism and it was such a glorious day that I was speechless and I am just getting to writing about it now. For several days before Sunday it was rainy and cold here. The forecast for Sunday was sunny and warmer but we were prepared for any kind of weather. I should have known that Zach always brings beautiful weather as he did for Fran’s baby shower. He’s officially invited to all of my parties as our good weather charm. Zach was baptized outside, in the church garden under a beautiful sunny sky and cool September light breeze. He was dressed in his godfather’s (my son) baptismal outfit and he was a perfect angel. The congregation was all smiles and the family was full of pride as he looked like his hands were clasped in prayer for this picture of him as our Rector baptized him. He continued to cooperate in Church for the Eucharist service and anointing of oil. This picture of Zach with his parents, Fran and Josh and godparents, Hugh and Sonny and our Rector, Diana is one of my favorites. It was wonderful that some of Zach’s young cousins were here to help us celebrate and stood up front during the Baptism in the garden. Zach cooperated at the reception also and didn’t mind at all being passed around and held by many people - some of them meeting him for the first time. Zach's other grandmother, Doris, made beautiful favors with tags marked "Bless Zachary Michael 9/13/09" Doris is the crafty grandmother - I am going to have to bring different skills to the table. I’m finishing this post with a few more pictures to show off – Zach with his parents during the Baptism (notice he still has white socks on – they are soon gone), being shown off by his godparents and being held by our Rector right before he is baptized. Wishing all grandparents a Happy Grandparents Day! Tomorrow is Grandparents Day. I will be having a super day as it is also Zach’s Baptism day. I’ll be reporting on that complete with pictures later in the week. For now here is some information about Grandparents Day. Jimmy Carter first declared Grandparents Day a national holiday in 1979 and so this is the 30th anniversary of this celebration. Jimmy Carter asked us to reflect on the impact grandparents have on our own lives – and on society. I recommend we do that this Grandparents Day also. I read a statistic that there are 70 million grandparents in the United States. Can that be? Wow. I remember my grandparents very well. We lived upstairs from my maternal grandparents when I was very young, and I went downstairs for breakfast with them every morning. I remember my grandmother and mother doing a massive amount of baking and cooking at Christmas and the large kitchen table was full with baking preparation. I would “help” and ahhhh....I wish I had some of those recipes today. At Sunday dinner I always sat next to my grandfather - we had a special friendship. My paternal grandfather lived two blocks away. He had a mustache that tickled and we played dominoes together. He was hard of hearing and would visit us to watch a ballgame on Saturday afternoon as we had a TV – but it had to be very loud for him to hear it. Grandparents create special relationships and impart lessons that last a lifetime. As Carter wrote, "Grandparents are our continuing tie to the near-past, to the events and beliefs and experiences that so strongly affect our lives and the world around us." Grandparents.com has a major celebration going on. Visit for great articles, activities and more. Check out the groups – I am the moderator of the New Grandparents group – I hope you will join us. On Thursday I had a great time celebrating at a pre-Grandparents Day party on Twitter and I met both of these Mommy Bloggers. There were mothers and grandmothers and super conversation – all 140 characters (That’s the limit on Twitter) at a time. The group is planning a Grandparents Night Out for 2010. Sounds like fun already. But this year I have to get back to party preparations for tomorrow afternoon at my house. Have a wonderful Grandparents Day. I am now hosting a group at Grandparents.com called “New Grandparents.” It is a new group and we already have 22 members – please come join us and chime in on the conversation. Grandparents.com is a great resource rich website for grandparents - it is really chock full of useful information. A recent article entitled 14 Best Baby Books provides a wonderful list of books especially for babies. I recently went to my local Barnes and Noble and felt both overwhelmed and not enthusiastic at the same time as I flipped through the choices of baby books. The few books I liked seemed awfully overpriced and I wound up not buying any. Fortunately at my daughter’s baby shower many people brought a book and Zach has quite a wonderful starter library. This book is not discounted but it is very inexpensive. I remember Sandra Boynton when I read to my own kids - starting with Fran 28 years ago – and she was always a favorite. It looks like she still is. This book is highly recommended for an older child when a Mom is expecting. Looks like a winner to me. This book is a rhyming gem and Helen Oxenbury (another illustrator familiar to my children) make this book a winner – and a good buy with the Amazon discount. This Caldecott Book winner with black and white illustrations is called “luminous” by one reviewer” and destined to be a classic by another. I know my kids were drawn to several books done in black and white and this one seems to spark the imagination and the heart. You can click on the title of the book in the Great Books for Your Grandchild box in the sidebar and go straight to Amazon if you are interested in any of these books. My daughter has bought a small pool and Zach loves spending hot summer afternoons in the pool. His Mom is a great swimmer and she is of those people who can hold her breadth forever underwater. So Zach – I bet swimming is in your future. I am having a wonderful time introducing Zach to new people and they all seem to enjoy seeing my transformation into a beaming grandmother. I went to the flea market at our summer community on Saturday and noticed something that I haven’t noticed before. There were great values on toys for young children and all the customers in this section were young children and grandmothers. Parents are hoping to rid themselves of more of this stuff but grandmothers all think it is cute and looks like lots of fun. I bought the most adorable lawnmower for a toddler…maybe next summer Zach – I have it stored in a safe place. Some friends were buying toys such as a tractor and a vacuum cleaner. What fun! I haven’t shopped for this kind of stuff…well in a generation! Well that’s it for now. I hope you enjoyed the tidbits. Please leave a comment with some of your own tidbits about you and your grandchildren. People who read this blog also mention the comments to me and so they are read. My guest blogger this week is Fran - the expectant mother. I think that Fran has provided an insightful look at the mother-daughter relationship along with the normal concerns that first time mothers-to-be have as the due date gets this close. I am Fran, the pregnant one. I have never needed my mother more then during this pregnancy. Early on I received weekly ultra sounds to check on the baby due to my history of three miscarriages. I needed her with me for support. She was with me when we heard his heartbeat for the first time. I’m full term now and two and a half weeks away from my due date. I also am so scared of all the unknowns related to labor and delivery. I’m ready to hold him in my arms and be the mother but I am so scared of not knowing what will happen. I know every labor and delivery is different. But I had asked my mom to be there if Josh has a hard time being supportive and she clearly takes that as a compliment. We have always been a close family, as you can probably tell. As my mom and I have different personalities leading to the usual mother/daughter issues, we also very much love each other and are close. My dad and I were talking yesterday about family support post baby. He said that while both him and my mom loved their parents, they really only had each other to rely on. I’m lucky. Both sets of grandparents live in the same town so Zach will be able to get to know them really well. The only grandparent I got to know well was my mother’s mother. I wish I knew all of them better. We are lucky to be able to provide for Zach the opportunities to get to know all of his grandparents well so a long time from now when they are no longer here, he’ll remember them and those memories will carry with him. I truly feel that this is a gift we are able to give him. On Tuesdays I eat lunch with my parents, and this will continue once Zach is born and provide time for him to spend with grandma and grandpa. On Saturdays Josh visits his parents and will bring Zach with him to spend time there too. We also still have weekly dinners with my family where my dad has claimed that Zach will sit next to him. These dinners are a very important part of my week. The name debate. In my dad’s post he mentions what he’ll be called. There actually is a story behind that. My brother and I called my mom’s parents “Grandma” and “Grandpa” (grandpa died a year before I was born). We called my dad’s parent’s “Nana” and “PopPop”. For me, I have always loved that we had different names for the different sets of grandparents. For as long as I can remember I wanted to do that for my kids. Problem: Josh’s parents have four grandkids already and they refer to them as “Grandma” and “Grandpa”. My mom’s grandparents were “Grandma” and “Grandpa” and that’s all she is willing to respond too (my stubborness, which Zach apparently also possesses was inherited from her). My dad’s grandfather was called “Pop”. He would prefer to be called “Pop”. Since “Grandma” and “Grandpa” are taken I wanted to go with “Pop” and “Nana”. My mother does not want to be called “Nana”. One thing I have learned to do is pick my battles so against my preferences but for the sake of family peace my parents will be called “Grandma” and “Grandpa” since it’s important to me the names at least match. It’s looking like Zach is going to be on the bigger size so we don’t want to pack clothing for him just yet even though clothing in Newborn, 0-3 Months, and 3 Months are all clean and ready for him to wear. I decided to give my mom the honor of choosing his hospital clothes after he is born and we know his actual weight and height. I hope my mom feels that this truly is a special thing since I think most new moms like to make the choice themselves. My mom and I have gotten closer with this pregnancy and I hope we continue to get closer as we share the experience of both being mothers. I know one thing about my mom though, it’s not easy for her to think of me as a mother but this experience has encouraged her to reflect on her experiences in becoming a mother. I am do grateful to have her help and support through this. Josh is wonderful, there is no better and more supportive father to be, but sometimes in life, no matter the age, a girl just needs her mother. While I’m in labor but before delivery I know one thing, I will need my mom to help me. When we hear Zach cry for the first time, whoever is with me, it will be not only the start of a new generation in our family but a creation of a new bond between us. A bond she will never share with my brother but always will with me, the bond of motherhood.